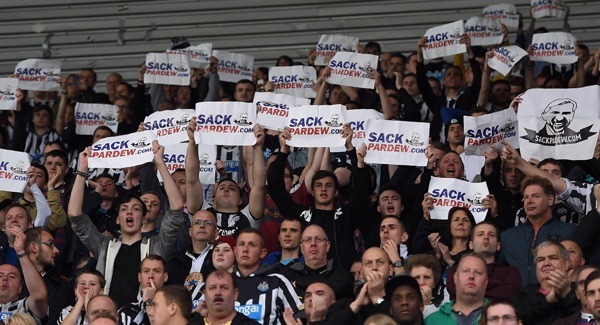 Angry Newcastle fans displaying banners in protest to sack Pardew. 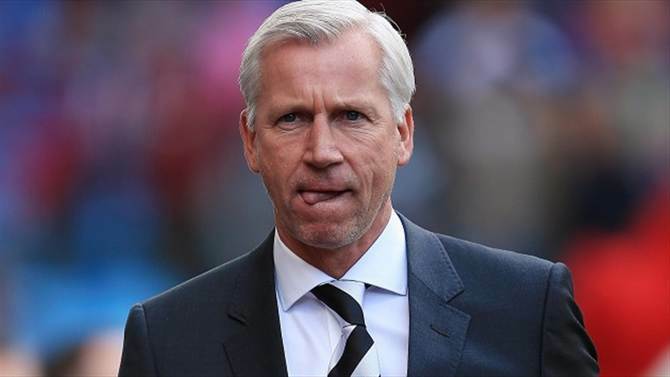 It has emerged reports that Alan Pardew will remain as the Newcastle United manager for now. The unstable Newcastle boss will still be in charge for the clash against Swansea on Saturday and he won’t be on the firing line despite the 1-0 defeat against Stoke City on Monday. It also means Pardew will still remain as the manager should Newcastle lose to Swansea at the Liberty Stadium. Over the course of the next few days, Pardew will have day-to-day meetings with Newcastle owner Mike Ashley, as suggested when Newcastle were defeated by Stoke last night; leaving his side second from bottom of the Premier League (19th), in the table; still without a victory in the opening six games. “It leaves us in the bottom three. We’ve got to fight, I’ve got to fight and the team’s got to fight and that’s what we’ll continue to do until we turn it round. “I don’t expect a serious conversation with Mike Ashley tonight but I think we’ll have some serious conversations before Saturday, because he doesn’t want to lose and nor do I. “It’s important that I showed to the team that I’m here to lead. Following on from the Pardew saga, Stoke punished poor-form Newcastle in last night’s Monday clash with a 1-0 win, thanks to Peter Crouch scoring the winner at the Britannia Stadium; ensuring Newcastle carry on the season without win after 6 games played. Stoke striker Crouch, headed home from Moses’ cross from the left-wing in the opening 15 minutes to put Stoke ahead. Newcastle’s troubles could have been made worse with a penalty, when Newcastle man and French international, Yoan Gouffran, brought down Victor Moses in the box, but their appeal was denied. Newcastle had no major chances despite efforts from Daryl Janmaat and Coloccini were squandered. To sum this up with pathetic fallacy, a loud clap of thunder broke out over Stoke-on-Trent; adding to the dark and gloomy mood surrounding Newcastle, the fans, the players and more importantly, Alan Pardew.